online application form for this Odisha Public Service Commission OPSC Assistant Section Officer ASO Exam is 09-11-2018 and starting date of application form online is 10-10-2018. Candidates selection for Odisha PSC Assistant Section Officer Recruitment Exam 2018 will be based on CBT computer based online exam, skill test and interview only. Interested candidates can apply online through Odisha PSC official web site only at http://opsconline.gov.in. Before applying for this OPSC ASO jobs candidates have to register online through OPSC website. 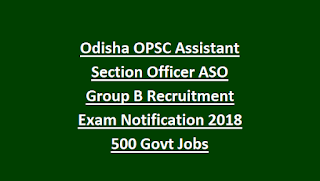 For more details regarding Odisha OPSC ASO Asst Section Officer eligibility criteria, admit card, exam date, aso exam syllabus, aso exam pattern, salary, selection process, how to apply online and more information is given below. 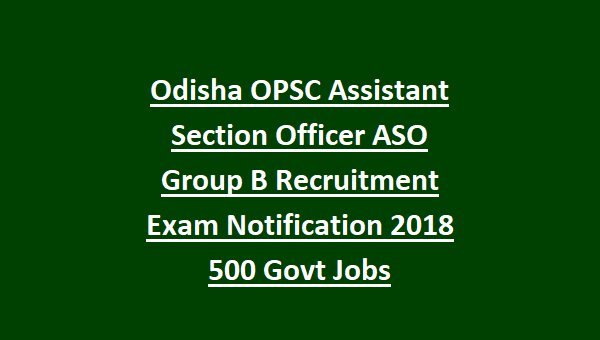 Notification of Odisha ASO Assistant Section Officer Recruitment Exam 2018. There are total 500 vacancies available in Odisha Home Department. Category wise vacancies will be updated. Must have qualified degree for applying these ASO jobs of Odisha Home department. And must have good knowledge in Computer Application. Age limits as on 01-01-2018 general candidates age limit are 21-32 years and age relaxations are applicable for the reserved candidates. Selection for this OPSC Assistant Section Officer recruitment is held based online exam, skill test and interview only. For the candidates of General/SEBC candidates Application fee or examination fee is Rs.300/-. For SC/ST candidates no application fee. Written exam will consist of 4 papers. All the papers of Objective Multiple Choice type and Computer Skill Test will be conducted for this ASO jobs of OPSC. Online applications only accepted for this OPSC ASO recruitment. Official website to submit the application for online for these Odisha Home Department Assistant Section Officer jobs is www.opsconline.gov.in. Last date to apply online is 09-11-2018. OPSC ASO Exam date, admit card release date, ASO Exam Syllabus and other details are given below. Apply online for the ODISHA PSC Assistant Section Officer Recruitment Exam 2018. Please share this Odisha Assistant Section Officer Recruitment 2018 article to your lovable friends through online via social web.